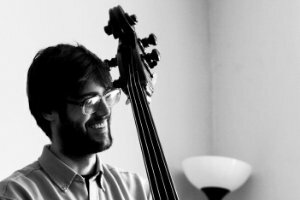 Bass Guitar lessons in Leeds with Sam Q.
I attended the Yamaha Jazz Summer School in Falmouth as an assistant tutor in 2014, teaching a range of pupils of all ages and abilities. I have had a number of private students, and completed a module in music tuition during my studies at Leeds College of Music. I always try to relate what is covered in lessons to performance situations, and will aim to explain how lesson topics can be applied in a range of situations. I am happy to guide students through grade exams but also happy to focus on particular aspects a student may want to work on outside of these syllabuses. I am most familiar with the Rockschool syllabus for electric bass, but am also an experienced double bass player. I specialise in jazz, in particular the construction of bass lines and solos over chord changes. I am also comfortable teaching essential core fundamental skills, such as technique, scale/fingerboard knowledge, harmonic knowledge, sight reading, ear training, time-feel, recommended listening, practice tips and composition. I am able to provide students with hand outs and will be able to design and recommend exercises to students to help practice topics covered in lessons. I also have experience teaching students within an ensemble setting, and would be comfortable leading a workshop/rehearsal for an ensemble. I am based in Headingley, Leeds but am happy to travel to students houses. Book a block of 10 lessons for a 10% discount. I had the pleasure of taking lessons with Sam as part of the Jazz Summer School at Falmouth University. Sam is a great teacher well as an incredible player and the short time I spent learning from him has been invaluable to my playing. He was able to demystify walking bass lines and helped me to understand exactly what I need to be practicing. Using his advice over the last few months I have seen a massive improvement in my playing." Thank you so much for all the tips and advice over the week. My playing has improved tremendously and you've inspired me to work even harder in future and to continue playing the bass."